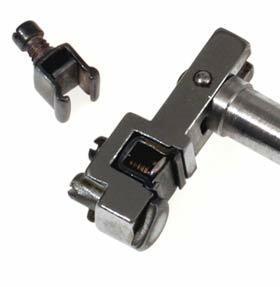 Goldblatt’s clamps, one shown in placement tool. Below instruments used to operate clamps. Harry Goldblatt (1891-1977) received his M.D. from McGill University Medical School in 1916. He began a surgical residency, but when the U.S. entered the war he enlisted in the medical reserves of the U.S. army. He was sent to France and later Germany as an orthopedic specialist. He returned to Cleveland in 1924 as assistant professor of pathology at Western Reserve University School of Medicine, and in 1954 was appointed Professor of Experimental Pathology. In 1961 he was named emeritus, but in the same year was appointed director of the Louis D. Beaumont Memorial Research Laboratories at Mt. Sinai. He worked there until he retired in 1976. He died January 6, 1977. 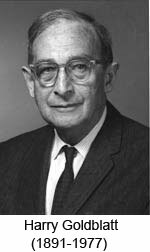 Goldblatt’s interest in hypertension, sparked during his days as a surgical resident, eventually would lead to his international fame. During his early days in pathology, he noted persons with normal blood pressure who had systemic atherosclerosis (colloquially referred to as hardening of the arteries) that did not affect the kidney, and conversely patients with hypertension where arteriosclerosis was confined to the renal arteries. He had been taught that so-called benign essential hypertension was defined as persistent elevation of the blood pressure of unknown etiology, without significant impairment of the renal functions, and that the elevated blood pressure comes first and results in vascular sclerosis. In some cases renal damage does occur and may eventually lead to uremia. Goldblatt’s own observations; however, led him to believe that vascular sclerosis came first, followed by elevated blood pressure. Testing this theory was difficult however, because Goldblatt did not know how to reproduce vascular sclerosis. He decided that simulating the results of obliterative renal vascular disease by constricting the arteries leading to the kidneys would be sufficient. In order to achieve constriction of the renal arteries, Goldblatt developed the clamps seen in the picture. His experiments using the clamps, performed on dogs, showed an increase in hypertension with no renal impairments. One of the earliest, unexpected findings was the constriction of one renal artery resulted in temporary elevation of blood pressure which returned to normal when the clamp was removed. Subsequent experiments by Goldblatt and others revealed that the constriction of the renal arteries causes a chemical chain reaction leading to hypertension. Renin, a substance released by the kidneys, is generated when the renal arteries are constricted. Renin in the bloodstream causes the production of angiotensin 1. Angiotensin 1 is benign until it reacts with the angiotensin converting enzyme (ACE) to become angiotensin 2, which is a major cause of hypertension. The clamps built by Goldblatt initiated a chain reaction as well. Successive experiments and discoveries eventually led to the isolation of an ACE inhibitor. By preventing angiotensin 1 from becoming angiotensin 2, this inhibitor has reduced the risk of stroke, heart attack, and heart failure in many hypertension patients. Goldblatt received many honors, most importantly the scientific achievement award of the A.M.A. in 1976. Because of the implications of his work, the American Heart Association established the Dr. Harry Goldblatt Fellowship. In 1957, to commemorate the 25 th anniversary of Goldblatt’s first successful experiment to induce arterial hypertension by renal ischemia in the dog, the University of Michigan held a conference on the basic mechanism of arterial hypertension at Ann Arbor. It was here that the confusion regarding the names of the various compounds was settled, and a universal nomenclature for angiotensin was accepted.